Initially I thought that it wouldn't work, sometimes these things are too good to be true. 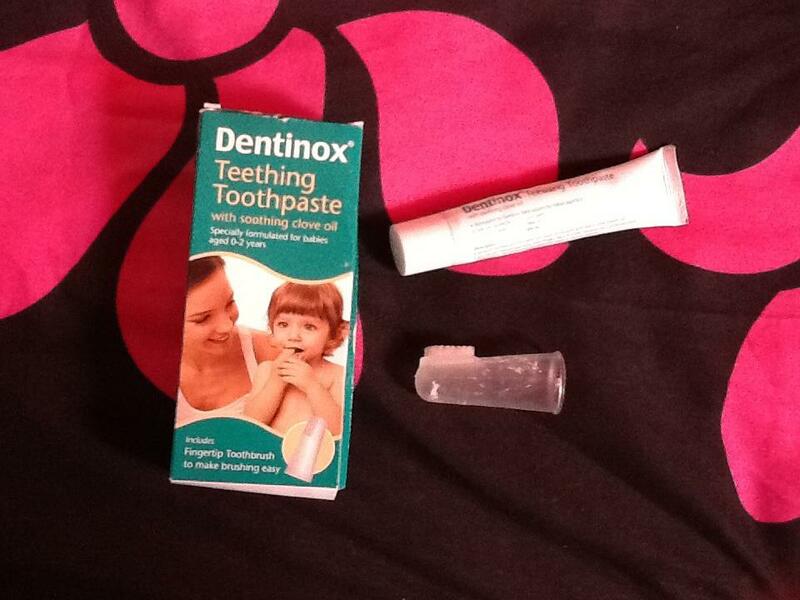 The instructions very easy and simple to follow, i used a small bowl of warm water and just popped it in my room. My daughter is very sniffy at the moment and im a hayfever suffer too. The fragrance was lovely and mild not really strong, it helped soothe me so it must if helped Lexie too while sleeping. 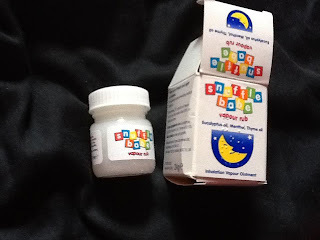 I love how the product is 100% natural and is and really helps improve baby's breathing right from birth. The pure essential oils are very gentle and help decongest and relax babies to promote restful sleep. I absolutely love this product its going to come handy in the winter with sniffles and colds. For best results use as part of the Baby nose-clear Bedtime Routine which includes first suctioning the nose with the award winning Nasal Aspirator the vapour makes a lovely pure and antiseptic air freshener when you want to be relaxed, refreshed and revitalised. safe in the inhaler dummy from 3 months. We are a massive fan of books, we always read three before bedtime. 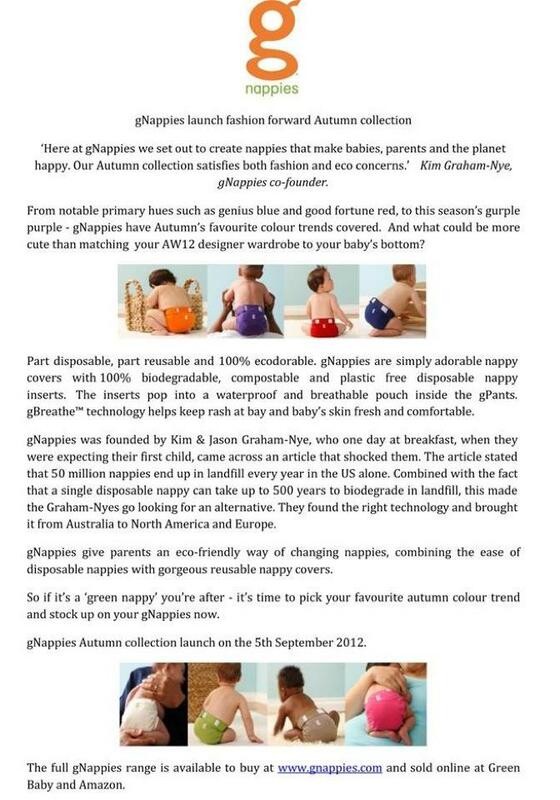 So we was super pleased to be asked to review some more blue apple books. A book that struck a chord of recognition and delight in both grandkids and grandparents is now re-issued. Going well beyond the shawl and cane stereotype , this grandparent is a sports fans, assistant, secret keeper, referee, dictionary, and 75 other “uses.” The overall portrait is smart, well-rounded, and sure to inspire multi-generational giggles and affection. The next book is A-B-C dentist, Raiden is at the age where he loves asking questions about things and hes favorite question is why. this book was perfect to go in to detail about things that happen at the dentist from a-Z. I loved the appropriate, realistic, and calm tone with great information. From Appointments, Bibs, and Cavities through X-rays and how to combat an icky Yellow film on teeth, this book takes kids on an informative and reassuring tour of the typical equipment, conditions, and procedures they are likely to experience during visits to the dentist. The last book was ABC doctor which was the same concept of the dentist one and Raidens favourtive these have became he's new favourtive story's. From Appointments, Bandages, and Check-ups through X-rays and feeling Yucky, this book takes kids on an informative and reassuring tour of the typical equipment, conditions, and procedures they are likely to experience during visits to the doctor. Mix all ingredients together by hand combined & slightly sticky, not to much or it will be to sticky to roll. Roll in to balls and flatten or use a cutter. Place mixture on a greased tray. Bake on gas mark 4 for 12 - 15 minutes. My Entry to the next seven days of shoes competition. I've tried to be versatile and make the outfits go with most of the shoes and be dressed down with the ballerina flats for day/work wear. Lots of prints, bold statement pieces & autumn colours. 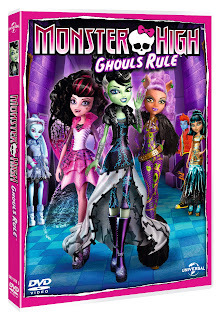 To celebrate the release of Monster High: Ghoul’s Rule (out 8th October), National Cupcake Week (September 17 - 23) and the coming of Halloween, The Boutique Cupcake designed some special quirky cupcakes for you to go cupcake crazy at home! 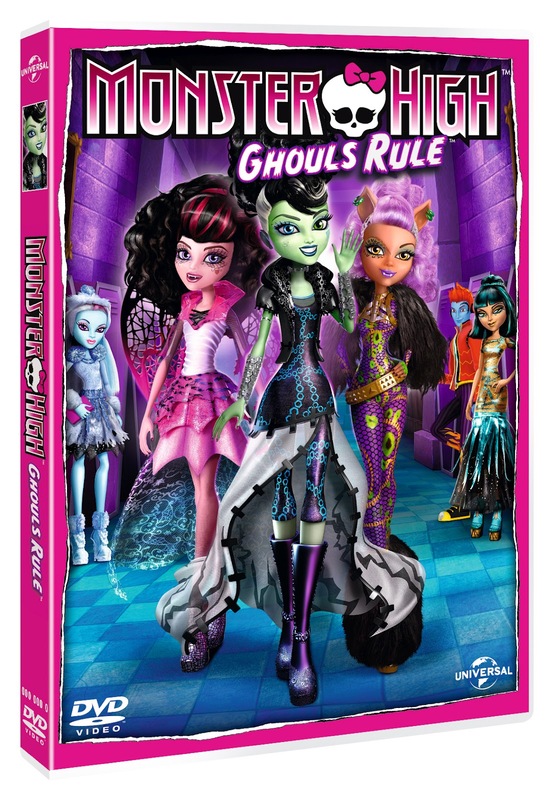 The styles range in technical difficulty allowing kids to create as many/few styles as they wish. The equipment / tools of the trade! Firstly, before you do anything – wash your hands! Using your palette knife lift the discs onto the greaseproof paper and leave to set (ideally overnight) – repeat for the other two colours so that you end up with 12 discs in total. Roll out some black sugarpaste (as you did for the discs) – using a small heart cutter cut out some hearts. These can be placed in the middle of the pink or blue discs. You can sprinkle a little glitter on the middle of them for a little added ‘bling’! Roll out some black sugarpaste (as you did for the discs) – using a small heart cutter cut out some hearts. These can be placed in the middle of the pink or black discs. The using your black pen, add the stitching’ to each heart – don’t press too hard! Score a couple of black discs with the blunt side of a knife so that you have a criss-cross pattern ( press gently as you don’t wan to go all the way through the icing!). Place your pink & balls sugar balls where the lines meet. As you did earlier, roll out some black sugarpaste. Using either a bat cutter or a template made from the Internet (see top tips) cut out some bat shapes. Then using a very small heart cutter cut of some pink hearts to go in the middle, we placed some white sugar balls in the middle but you can just use glitter if you prefer as you did for the black hearts. Once finished they can be placed in the middle of the blue discs. Either using a template cut for the Internet or by cutting free-hand, cut out some pink lips from rolled-out sugarpaste. The teeth are cut from white sugarpaste and placed in the middle of the lips. Again we used a little glitter to each decoration. These can then be laced in the middle of the blue discs. Roll out some white sugarpaste as you did earlier. Using a template (or free-hand) – cut out some skull shaped toppers. To make the bows we cut out tiny hearts and placed them next to each other and added a little blob of pink sugarpaste in the middle to create the bow effect, we then drew on some black lines to make them look more realistic. We used the black decorating gel (not the pen) to create the eyes and nose. Then using a toothpick we carefully “pulled” away from the eye to create the eyelashes. Once the bows have been placed in the top right hand corner of the head the skulls can be out onto some black discs. Once your decorations have been left to set – ideally overnight you are ready to put everything together. Once your ‘toppers’ have set (on greaseproof paper) then you are ready to put everything together. 1) You need to put a swirl or blob of icing on each cake – to do this cut the tip off of your icing bag and place the nozzle inside. Fill the bag with some of your buttercream icing – do not fill the bag more than half-full otherwise you may find the icing spills out of the top as you squeeze! 1) Add something called Tylo Powder to your sugarpaste to make it a little less sticky and it helps your toppers to set. This can be bought from any good cake supply shop or online. 3) You can colour your own sugarpaste from scratch – you will need gel colours rather than liquid and gloves should be worn to avoid your hands turning pink or blue! Black is very difficult to make so should be shop-bought ideally. 6) We use something called Edible Glue (This can be bought from any good cake supply shop or online) – we use it to stick the sugar balls to the sugarpaste and the smaller pieces onto the discs. This isn’t essential but will hold everything in place. Cream the butter and sugar, add the eggs. Add half the flour and then half the milk and mix until fully combined. Repeat with the remaining flour and milk. Pop in a greased up tin and bake for 15-20 minutes on gas mark 4. After the cake is cool, crumble the cake thoroughly in a large mixing bowl. You may want to remove the crusts of the cake with a kitchen knife first to avoid any lumps. Once you have crumbled the cake take your frosting, a heaped tablespoon at a time, and begin mixing it in light sticky texture. Wrap the mixture in cling film and chill for at least 60 minutes. The mixture should be firm. Take out the mixture and roll little balls with your hands. ( Don't do them to big as we made that mistake last time and they fell of the stick) Pop in lolly sticks and re fridge until they are firm. Melt you chocolate them dip the pops in covering all the pop up to the stick so it secures it. Place on a tray lined with greaseproof paper. Decorate with anything you like, this is what we used. I have a great guest post this week on controlled crying from Hollie Smith. As a mom myself I've always found it hard to just sit and watch my children cry. Until i remembered that a little tough love is sometimes the way forward, having to wean my son of he's bottle after buying bottle after bottle the only way was to give him the bottle bit back and give him a cup with milk in. In the end we had three nights of tears and tantrums, but soon after that it was all forgotten. all the moment we are in the progress of doing up the children's room, to help them settle in. most nights i wake up with both of them in my bed. My daughter at 17 months till not sleeping though.I know its going to be a huge battle and im sure tears from me and her, but she needs to realise my bed is my space and bed is hers. So here is Hollie Smith tips on how to handle controlled crying and how you don't have to feel like a bad guy. There was good news for exhausted parents from the land of Oz last week. Australian researchers have found that the use of ‘controlled crying’ as a sleep training technique is not harmful or dangerous, after all. http://www.abc.net.au/news/2012-09-11/study-finds-controlled-crying-is-safe-for-babies/4254446 If anything - the study by the Murdoch Children’s Research Institute claims - short term use of the strategy may be beneficial for the mental health of both parent and child. These are reassuring findings for me from a personal point of view, since my other half and I let both our daughters ‘cry it out’ over a period of several nights when they were six months old, in a (successful) bid to convince them not to bother us until morning, and combat the misery of persistent sleep deprivation. Understandably, controlled crying is controversial. I’ve always been confident in claiming it to be safe, because the majority of experts seem to agree that it is. But I’m also careful to point out that it has opponents, as well as advocates - in particular, Professor Margot Sunderland, who’s vociferously argued that leaving a baby to cry for too long could cause them long-term emotional damage. Among parents, too, feelings run high on the subject, as I know from canvassing many views over the years. Some refuse point blank to countenance controlled crying because it simply feels wrong to leave their little one sobbing, whilst many others have tried it and given up, having decided it’s just too hard to hear their baby loudly voicing his distress, alone, for long stretches of time. And it is hard seeing it through, there’s no doubt about it: the phrase I use is that it’s most definitely not for the faint-hearted. On the other hand, sleep deprivation is a truly horrible thing. And those who score a speedy result with controlled crying do tend to wax lyrical afterwards, usually reporting that it restored their sanity, and that their child slept well from that moment on. I have to confess, it worked a treat for us, within a few short nights. And yes, both our girls have been ‘good sleepers’ ever since - and no, there don’t appear to be any signs, so far, of emotional damage, ten and eight years on (other than the pretty usual ups and downs of a normal childhood, of course). So, if you’ve done controlled crying in the past, or are considering it for now, or will be in the future, I hope that this new research is reassuring for you, too. · Before you attempt controlled crying, your baby should be six months old and have made a good start on solids, and still be getting regular milk feeds in the day, so that you know for sure he’s not crying from hunger. · Choose a good time. Make sure he’s healthy, and not suffering from teething, a cold, nappy rash, or anything that could legitimately be making him wakeful. Avoid periods where there’s something going on in his life that might unsettle him. It will help if you’re in a good place, too – you might need to be mentally strong to see you through. If one or both of you can take time off work for the duration, so much the better. · Be prepared. Do your research, so you know exactly what the technique involves and how you’re going to put it in to practise. · Warn your neighbours, if the walls are thin. · Get other good sleep habits in place first, if you haven’t already: a comforting, early bedtime routine; the right amount of daytime napping; aiming to always put him down whilst awake, to encourage self-settling. · Steel yourself. Be determined. Controlled crying only works if you’re truly committed to it. · At the start, leave your baby to cry for three to five minutes at a time before briefly going to his cot to check he’s ok, offering him words of reassurance, and leaving the room again. Lengthen the amount of time between checks, but don’t leave him for more than ten to 15 minutes at a time. I stubbed across Carla Daly one night late and was really impressed with the bold, colourful and unique deigns! After working in nurseries for so long, I know it's important for children what you stick on there walls. Raiden has a few cheap posters on he's wall which are adding up and tell the time, but I find myself having to stick them back up all the time, due to them falling down. The wall art came and i was shocked to see it was very sturdy, brilliant size, lovely colours and a really nice unusual piece for a room. The pictures are bright and bold and very unique. We are actually just starting to re decorate the children's room so this is going to be perfect for both children, plus it's not just wall art it's a leading tool also. They are easy to attach to the wall, which sticky tabs. Carla also produces alphabet wall stickers, growth charts, personalised door signs and maps, all of which would brighten up any child's room and make an unusual and thoughtful gift. Anyone who has hayfever knows how awful the symptoms can be, I've had hayfever since I was in my teens and it each year it seems to get worse and worse. Though out the summer I take two antihistamines in the morning, around 5.30 I shut and the windows and switch my air purifier. This helps as the pollen is setting down. I remember trying a nose spray quite a while back and it didn't help much, prevalin sent me an awesome festival pack along with a nose spray to try out. I found blowing your nose hen using the spray has actually really helped with my sinuses. 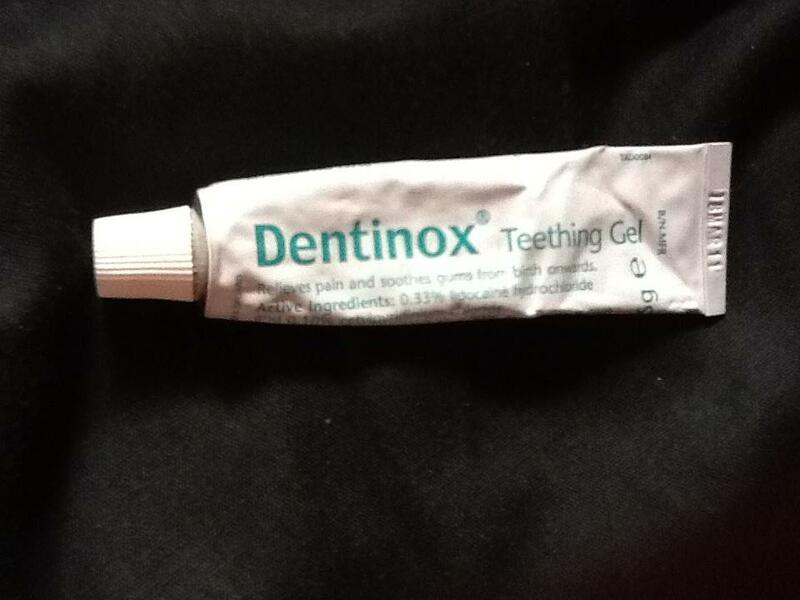 I've actually popped it in my handbag so I always have it when on the go. Once shaken Prevalin becomes a liquid that can be easily sprayed into the nose. irritating the nasal mucosa and causing symptoms. Celebrating 25 years this fantastic silver anniversary the Sylvanian's are off on their holidays!! 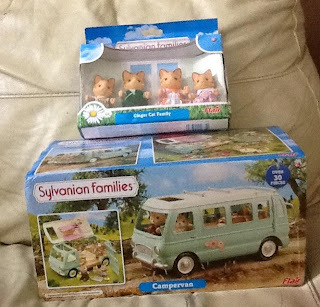 Setting off on holiday adventures, every Sylvanian needs the new Camper Van (RRP £39.99)! A beautifully detailed motor home, ready to take children on a journey full of exploration and imagination! Stunningly detailed, full to the brim of essential home comforts in miniature perfection. Raiden was really excited when we got this to review he's always liked the look of sylvanian family but we have never brought any. He unpacked it the camper van and we set it and and popped all the stickers on.We also got a family pack of ginger cats. There are pull down beds in the roof with matching cosy sleeping bags, a fold out table and seating area which can even be taken out to give even more space to play inside. In the kitchen are there is a sink and hob with lots of cupboard space. Outside on the roof when everything is closed up there's space for bikes. Comes with cute kitchen stuff like frying pans, food, cutlery and even board games. Raiden' s none stopped played with this since it has come he has absolutely Loves the camper van, even he's baby sister loves to play with it too. Dentinox Teething Gel: The award winning teething gel gets to work swiftly and can be used every 20 minutes to provide effective relief. Suitable from birth, it’s sugar free and contains an antiseptic. Contains Lidocaine Hydrochloride and Cetylpridinium Chloride). We have been using this since Lexie was a baby and i think it generally helps. Dentinox Cradle Cap Treatment Shampoo: A gold winner[i] for mum’s and dad’s, this non messy shampoo is a highly effective, gentle remedy – even kind enough to use regularly once the cradle cap has cleared up. (Contains Sodium Lauryl Ether Sulpho-Succinate and Sodium Lauryl Ether Sulphate). This has been fab to get rid of LExies cradle cap, we used to wash her hair then brush with a fine toothed comb. 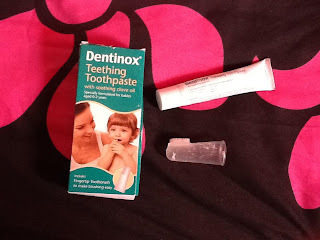 Dentinox Teething Toothpaste: The sugar free Teething Toothpaste helps ease teething pain woes and contains clove oil known for its soothing properties. It also comes with a special fingertip toothbrush which slips easily on to the index finger so that mum and dad can gently massage gums and new teeth. This has been great for Lexie as i think she's been suffering with her back teeth, so the little fingertip brush is great. Dentinox Infant Colic Drops, Dentinox Teething Gel, Dentinox Cradle Cap Treatment Shampoo and Snufflebabe Vapour Rub are all medicines. Always read the label. Labels: BRUSH, CRADLE CAP, DENTINOX, teething, TEETHING GEL. Clarks’ new Back to School shoes have hit the shelves and the 2012 collection is more stylish than ever. Kids will love the on-trend styling and parents will be pleased to see that for Clarks, style comes hand in hand with substance. Every child can have a one-on-one measuring appointment in store with a Clarks’ expert fitter to guarantee the perfect fit that Clarks kids shoes are known and loved for. We went armed on Friday, we had an appointment so I went and mentioned it to the lady at the till. Where we was told to wait by the kids shoes and she someone would be with us shortly. We was pretty much seen straight away. I was secretly happy as there was quite a few people waiting with tickets in there. Raidens feet was measured by the machine, and quite surprised he had only gone up half a size and we was asked what shoes we liked. We always go for Clarks as some of the designs have the thick rubber bit on the front. Raiden always scuffs the top part of the shoe, so we only like this style as it a normal pair would last five minutes. The lady went off and came back with two boxes, when she came back she said they only had two pairs in he's size. Which I was pretty shocked about as its the week before school. When I mentioned this, her reply was well it is a few days before school now. Which made me feel really small, I'm the parent and I should still have the choice of selection that a parent going in the first week of the summer holidays. We ended up going up a half a size bigger with a smaller fitting, to get the style we wanted. The assistant was pretty good with double checking that the width, deep and size was OK and correct and mentioned if we had any problems to bring them straight back. Which we was very pleased with in the end. The Back to School range is the epitome of playground style – for kids everywhere, and their parents too, this is a collection that successfully combines style, fun, originality and, of course, the kind of durability that delivers exceptional value for money. Clarks’ are now offering customers an online appointment booking service for their famous in-store fitting process to make parents’ preparation for the school term even easier www.clarks.co.uk/storeappointments. In addition, parents can also order their school shoes online at www.clarks.co.uk/kids/school to be delivered to their local store or straight to their door, completely hassle free.